WHAT and WHY: This workshop will identify challenges and gaps in the incorporation of remote sensing and modeling into coastal hazards decision-making, and will assist NASA to build capacity for research and disaster response related to individual and cascading coastal hazards. WHEN: Friday, April 28, 2017, 8:30 AM to 4:30 PM. WHO: This workshop is by invitation only for members of the disasters science community, including federal, state and local government representatives and academia. 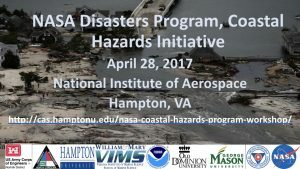 WHERE: Room 101, National Institute of Aerospace 100 Exploration Way, Hampton, VA 23666. Ample parking is available. Workshop participation also via WEBEX. AGENDA: The workshop will consist of morning presentations followed by a working lunch and two working sessions in the afternoon. 1:15 Working Session 1: Identify core demonstration capabilities and representative cases. The Center for Atmospheric Sciences: Excellence in Research, Education, and Outreach.